In Toronto, there are many limousine service companies that advertise limo services, limo fleet, great limousine experience for all sorts of special occasions and more. From such limousine services including wedding limousines in Toronto, Toronto prom limo rentals, night out limousine services, bachelor limo services, Bachelorette limousine services, sporting event limousine reservations, concert event limo rentals, casino limo rides and more, there is so much to choose from, and that can sometimes make it difficult to choose the one company that is right for you. The same applies to looking to book a party bus limo as well. With many choices, one of the more important things to consider in Toronto, is a limo company that is dedicated in only providing services for party bus and limo bus fleet and services in Toronto. That one company is Platinum Party Bus Limos. We offer you with dedicated party bus limousine services for wedding limos, prom limos, night out limos and more. You can reserve one of our limo fleet for the above mentioned limo services that includes a party bus that seats 18 passengers up to 26 passengers, while our choice of larger limo buses can seat from 30 passengers up to 50 passengers, depending. 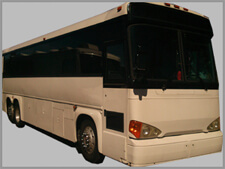 All our limo buses are luxurious and will make any special occasion an enjoyable one. Our limousine chauffeurs are also of the utmost in professionalism, so when you are looking for a party bus limo in Toronto, look to Platinum Party Bus Limos for all your party bus limo needs in Toronto.